Sling the sandals back in the loft where they belong, winter is well and truly here. You might have already stocked up on this season’s key pieces: the elegant checked shirts, the cozy shearling coats, the effortlessly cool roll-necks, the smart straight-legged trousers. 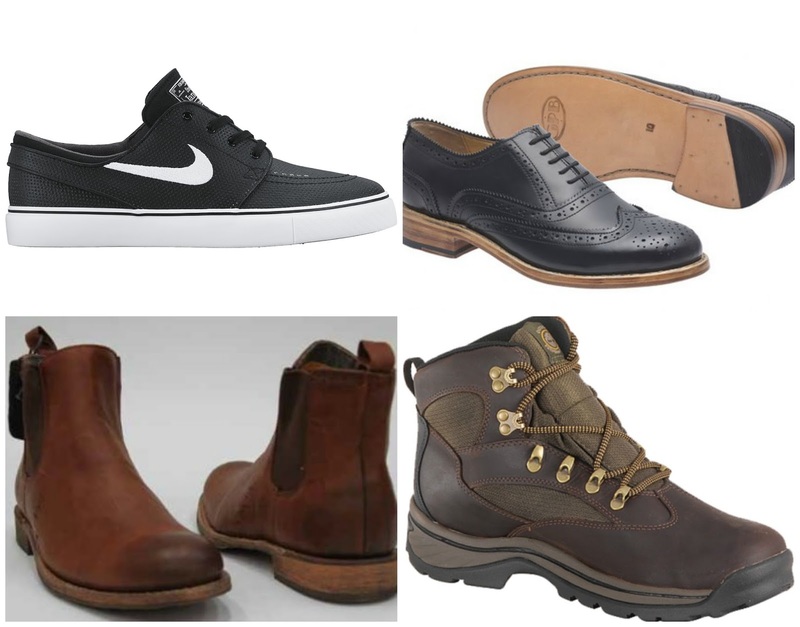 Tie your on-trend ensemble together with the right shoe - this winter, we’ve got you covered. For fitness fans or a casual day, trainers are never not in fashion. Keep them just right for everyday with some skate shoes, perfect with jeans and a jumper when you’re out and about. Alternatively, for a more smart/casual vibe, retro styles are coming back, inspired by the Adidas Originals Stan Smiths, with leather or suede completing the 1970s throwback feel. Retro trainers work equally well with joggers as they do with a smart tailored suit, while keeping you comfy. This season is all about androgynous silhouettes, which means that brogues are back in style. Clunky slip-ons are out, so opt instead for a smooth, streamlined leather with laces. Don’t be afraid to play with colour - earthy tones are in, so accessorize a monochrome black or grey outfit with burgundy or even rich blue brogues to offset your look. Different colours can allow perforated leather designs to really stand out, giving an otherwise plain combo some edge, or stick to a simple black to showcase snazzy socks. With the vintage throwback characterising the season, a pair of 1960s inspired Chelsea Boots are just the thing to bring an outfit together. They work best with skinny jeans or chinos and look effortlessly cool - opt for black leather to match every outfit, or unleash your wild side. Play with different textures like suede, snakeskin, or even velvet to add a subtle contrast to an outfit. Fancy yourself more of an Indiana Jones than a Beatle? Choose a rich mahogany shade that’s timeless and goes with any outfit - just remember to match your belt. The ultimate shoe for rainy days, snowy days, or general wintery walks, hiking boots are making a big comeback this year. Gone or the clunky tourist styles, as designers attempt to cash in on more luxurious styles. Match them to a shearling jacket for snuggly feet on a cold day, or choose a classic military style with longer laces and a mottled leather upper for effortless styling choices, whether you’re in or out of the wilderness. Love me some brogues! Need to get a new pair, so thanks for the reminder! I do like brogues and chelsea boots for Autumn, but I do wear my walking boots a lot on wetter days. There's something quite exciting about Chelsea boots! I like the ones you have pictured. I love a good pair of Chelsea boots Nadine - take a peek at Chatham Marine, they have loads of cool pairs and are quite reasonable. I need a new pair to go with my work suit. I think brogues look so smart. My daughter even has a pair for school! We're supposed to be in for a harsh winter, so boots with a bit of grip would be a good investment! A nice post. You should always have one pair of comfy and quality shoes, especially for winter. I am all about the boots - I look forward to Autumn so I can start wearing them again! I prefer to see brogues on men, come sun or hail, but I do know a pair of walking boots is much more fitting for the season. I love boots, they're just perfect for when they chilly weather sets in! Lovely selection here - I tend to wear hiking boots myself in the winter. Love those Chelsea boots...you can't beat nice warm footwear for winter, if my feet are cold the whole of me is cold!! Lovely selection. Ooh the brogues and the chelsea boots are fab although I'm sure my husband will have the walking boots out again before too long! I'm a massive boot fan, have more pairs than I do handbags!